One Dream World: Earth is evolving! I witnessed it! Earth is evolving! I witnessed it! In one of my recent journey I sat on my side upper berth on the train, watching a group of Muslim brothers, observing their extreme courtesy towards each other and fellow passengers. The Maulana soon took out his beads and began murmuring his chant, which diverted the attention of an elderly brahmin couple who were sitting besides them. They stared at the beads and his murmuring lips for quite sometime, and i judged in my mind what the brahmin couple would be thinking, something which i have been seeing all my life. This went on for sometime and i saw the lady getting impatient looking at the Maulana, and i sensed her to be irritated. Soon, she gathered some courage and spoke to the Maulana, which made him open his eyes and look at her. She asked innocently, "What mantra is it that you are chanting? And what kind of mala is that?" Now, i judged the Maulana to be irritated because she had proclaimed it to be a 'mantra'. The Maulana smiled and said he was chanting the name of God, yes he said "Bhagwan" not Allah, as i judged again and expected. She asked, "What does this mantra grant?" to which he smiled and calmly said, "This word of God i chant in His remembrance and to offer my gratitude for everything in life. It is all due to Him that you, me and all are able. We then forget Him. This chanting helps me praise Him, glorify him, and thank him and by doing so, i am constantly reminded of His presence." The lady looked happy, quite wrong to my judgement again. Her husband who was listening to it all, also agreed to what the Maulana said. The other Muslim folks who were with the Maulana, listened in silence of respect. The woman asked if she could get the similar white rosary beads in his hands and he said it was available in all mosques, to which the couple looked content with the information. 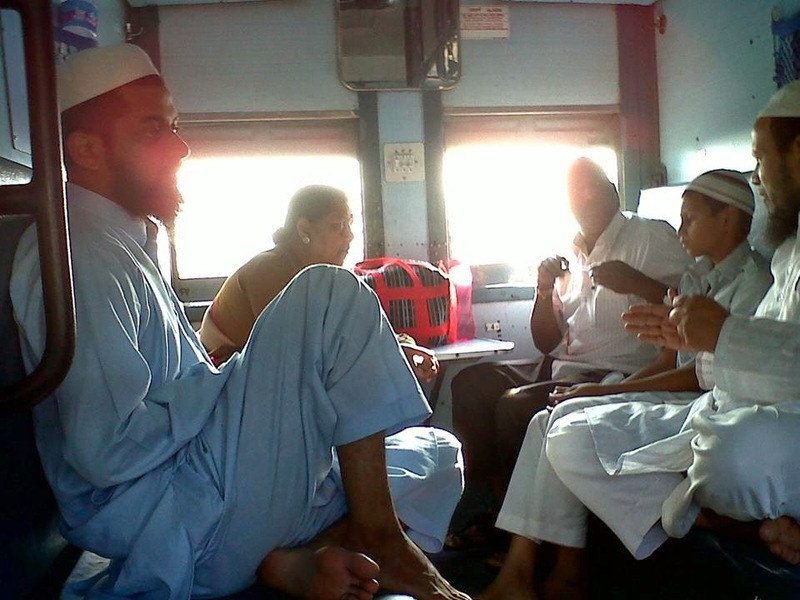 After some more discussion, the railway tea supplier was passing by and the Maulana wanted some tea. But as the tea guy poured a cup, he kept ordering more for the Brahmin couple, which they resisted, but could not for long resist His act of love. A cup was offered to me also, which i politely refused as i had just finished one, to which the Muslim brothers smiled and agreed. As they all lay down on their respective berth, one of the Muslim brother, came to me and asked me at the side upper berth if he could on the fan for me if i was feeling the hot weather. I smiled and thanked him as he onned the fan and moved to sleep. Very gently they all settled down to sleep smiling and conversing peacefully and lovingly in Urdu. The world is NOT as it looks or may be judged to be, because of what we hear or see or our past experiences or some preconceived notions about other religions and people. There exists greater harmony in the minds and hearts of people among all religion and creed; we only often become victims of someone else's ideas and thoughts of discrimination. Earth is certain evolving. i witnessed it. Mashaallah! Alhamdulillah! Aameen!